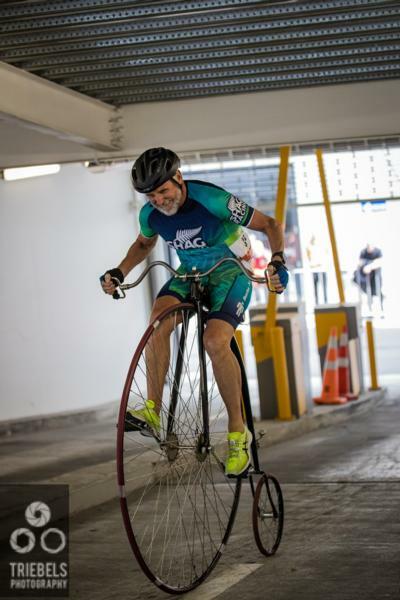 The music and legs were pumping as cyclists raced head-to-head up eight floors of a central Christchurch car building on Saturday to a party on the roof in an effort to raise awareness and funds for men’s health and Movember. A party atmosphere prevailed at Saturdays’ Urology Associates Movember Car Park Cannon Ball with a DJ providing the soundtrack backing efforts of the riders with the fastest taking just over one minute to reach the top of the recently renamed SALT District Carpark. “It was another great event,” event organiser John McKenzie from enthuse media & events said. Held for the first time last year the event featured cyclists competing in a series of rapid fire head to head races for men and women in both fixed and geared categories with a new over 45 men’s master grade. Donna Head and Josie Shum successfully defended their women’s geared and fixie titles won last year while 16 year old mountain biker Jacob Turner won the men’s geared grade that included road professional Ollie Jones. Aaron Hooper, who was runner up in the men’s geared grade last year, won the masters competition and the men’s fixie category was won by James Knudsen who competed in a leather jacket and jeans. McKenzie said the event is the only southern hemisphere round in a global series sponsored by Dutch beer brand aBLOC so to have it in Christchurch was a coup.